Pasta salad is a delicious, easy side dish. While most people usually make it in the summer, who says you can’t prepare it at any time of the year? When you find a great pasta salad recipe and master it, you’ll have a new go-to great dish for all sorts of situations. You can bring it to a summer barbecue, eat it as a side during dinner, or put it on the salads you bring to work for lunch. Pasta salad is a versatile dish that keeps well in the fridge. This pasta salad with eggs recipe is a great one because it has a lot of unique flavors. The bow tie pasta’s shape keeps all those great flavors. 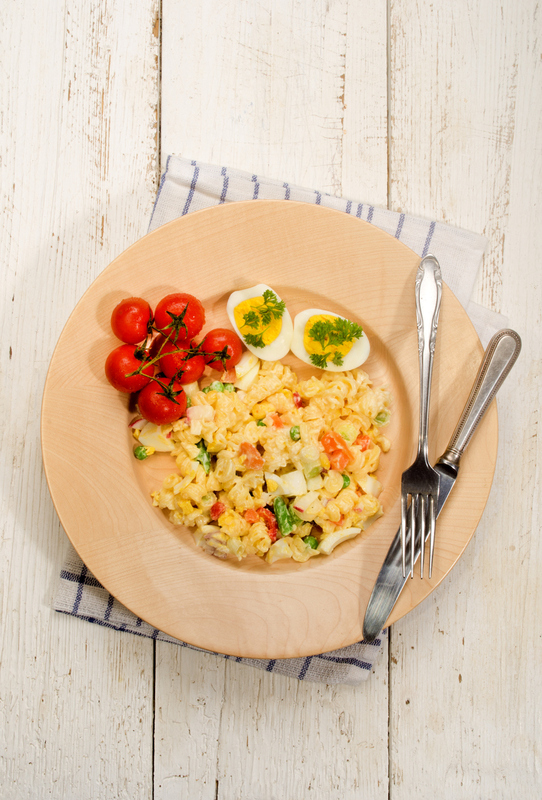 It’s packed with delicious, crisp veggies, and the eggs give it a boost of protein. The Italian seasoning brings everything together with its classic pasta salad flavor. Check out our vegetarian pasta salad recipe below to start cooking this dish soon! Hard boil your eggs. Put the eggs in a saucepan and cover with water. The water should go 1 inch over the eggs. Put the pan over medium-high heat and bring it to a boil, then cover. Remove the eggs from the heat and set them aside. Allow them to sit in the hot water for about eight minutes. Drain the eggs, cool them in ice water and then peel the shells. Once the eggs are cooled and peeled, chop them into small pieces. Toss all of your chopped, shredded and sliced veggies in a bowl with the olive oil, vinegar, Italian seasoning, salt, and black pepper. Set it aside. Cook the pasta according to the instructions on the box. Drain, then toss with a bit more olive oil to keep the pasta from sticking. Let the pasta cool completely. Put the pasta into a large bowl. Add the veggies, cheese, Italian seasoning, salt, black pepper, and eggs. Stir the mixture until all of the ingredients are well-combined. Add more olive oil or Italian seasoning if desired. To allow all of the flavors to combine, store in the refrigerator for at least 30 minutes. When you’re preparing this dish, make sure you use Sauder’s eggs. Using our eggs gives this vegetarian pasta salad something extra. At Sauder’s, we are dedicated to providing our customers with eggs that are the highest quality and freshness. That’s why we partner with trusted local farmers who are as committed as we are to achieving this mission. To find Sauder’s eggs at your nearest market, please use our store locator today.